In a previous paper published in this journal (Coombe 2005), I outlined a method of using Chladni patterns to tune mandolin free plates. In that paper I indicated that the method was most useful for maintaining consistency from instrument to instrument. However, there is very little hard evidence to indicate that the method is actually useful in violins, let alone mandolins where much less research has been done. For example, Atwood (1996) and Wilkins (2001) both failed to demonstrate any strong correlation between modes of vibration of free plates in violins, and the modes in a completed instrument. There is a big gap between measuring free plate modes and the tone of the completed instrument. Once the instrument is assembled, everything changes. The topic of plate tuning is very controversial among violin makers, and often discussions on Internet forums between the two protagonists end up in a slanging match. Fortunately that is not usually the case amongst mandolin makers, and the topic often comes up on Internet discussion forums. In this paper I have tried to examine this question and to test the hypotheses that Chladni plate tuning (or tap tuning) is somehow correlated to the tone of the completed instrument, and is therefore of some use to Luthiers. It does not matter if the modes change, and it is not necessary to understand what happens as an instrument is assembled, if there is a significant correlation. Testing this hypothesis is very difficult because of the difficulty of getting a large enough statistical sample of instruments together at the same time. Ideally the instruments would need to be identical except for the plate tuning so they would need to be made from the same species of wood, be made by the same maker, and also would need to be made at about the same time, since it is well known that the sound of a mandolin will change with age. Impossible to do unless one has access to a music instrument factory or a sizeable research grant! However, it is a much easier to disprove the hypothesis. If it is possible to make two identical mandolins that have the free plates tuned identical, and the resulting sound of the completed instruments are completely different, then the hypothesis is likely to be false. Conversely, if identical mandolins made with very different free plate tuning end up sounding identical or very similar, the hypothesis is once again likely to be false, although this is not as convincing. This type of experiment is fine in principle, but very difficult to do in practice. Wood is so highly variable in its physical properties, that rarely is it possible to tune free plates exactly the same. Even if the wood comes from identical trees, it is possible that the resulting free plates will tune differently, but at least if the wood does come from the same tree you are in with a chance. Unfortunately it is not always possible to get wood from the same tree. Other factors that are difficult to ensure are exactly the same (e.g. arching, neck stiffness) can also influence the result. Thus probably the best we can do are instruments that are close to identical, but not quite identical. In addition to this, is the very real practical problem of customers wanting their instruments delivered on time, and made according to their individual preferences. The end result is mostly a matter of pot luck (to have two instruments with similar free plate tuning at the same time) so direct comparisons can be made. One method of getting around the timing problem is to have a reference instrument against which the instruments in question are evaluated. My experience has been that mandolins with the free plates tuned similarly do in fact sound similar, but this has only been an empirical observation which required a more rigorous test, hence this paper. 3 pairs of mandolins were made over a period of about 18 months (amongst others ordered by customers). Pair (1) were European Spruce/Myrtle (#95 and #97) oval hole mandolins with the top and back made from wood from the same trees. Pair (2) were F soundhole mandolins with the top made from Red Spruce (#101 and #102) from the same tree, but the back was Tasmanian Myrtle from a different tree. Pair (3) were oval hole mandolins made from King Billy Pine and Blackwood (Acacia melanoxylon) from different trees (#103 and #105). Pairs (1) and (2) were tuned as close as I could practically manage, but pair (3) were tuned completely differently. I was able to keep pairs (2) and (3) together for some time, so I could compare the tonal qualities in some detail, but pair (1) were subject to customer delivery demands so I was not able to make direct comparisons. However, I was able to compare both of the mandolins from pair (1) to my reference oval hole mandolin (#87) for some days so had a good impression of the characteristics of both instruments as compared to the reference. The reference mandolin was similar (but slightly different) sounding and was made from the same woods. There was only a short time lag of a few days from when one mandolin was sent to the customer, and the other mandolin was strung up, so I am reasonably confident of the appraisal. My appraisals were checked by my partner, and where possible by another instrument maker. In every case they agreed with my appraisal. Chladni plate tuning frequencies of modes 1, 3 and 4 were recorded over a period of about 7 years for all the mandolins I have made. Comments on the tone of each mandolin were also recorded. In order to maintain consistency as much as possible over a period of time, each new mandolin was compared to a reference instrument. 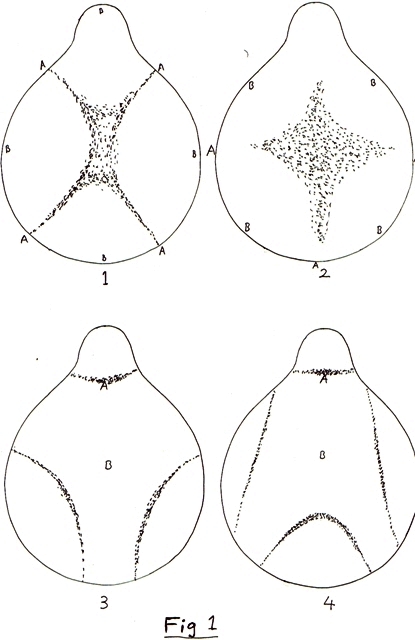 The free plate modes of a mandolin are shown in Figure 1 (from Coombe 2005). I normally do not try to measure mode 2, so that is missing. Mode 2 is usually fairly close to mode 1 and although mode 1 and mode 2 can be clearly heard as two distinctive tap tones, mode 1 dominates and for mode 2 it is usually difficult or impossible to get a Chadni pattern to form (see also Coombe 2005).. The frequencies of the free plate modes of the pairs of mandolins (top modes are after the braces had been glued) are shown in table 1. The percentages are the differences expressed as a percentage of the lower value. Tuning of pair (1) is very close and the sound of pair (1) were as far as I could determine identical. Both had exactly the same tonal characteristics when compared to the reference instrument. Pair (2) are F hole mandolins, unlike all the other mandolins in this paper which have an oval sound hole. I was able to play this pair for extended periods of time and my partner was also able to listen to the two mandolins one after the other. My impression as a player was that they sounded very similar, but not quite identical, with #102 having a slightly better sounding E string and being a bit more responsive. However, this difference was so small that I was able to repeatedly fool my partner which instrument I was playing when she was not able to see the instruments. I also managed to fool myself during one session in a darkened room. After swapping from instrument to instrument for a while I needed to turn the light on to work out which mandolin I was actually playing. Conclusion was that this pair of mandolins had tonal characteristics that were very close indeed, close enough to fool most people. Note that this pair were not as closely matched as pair (1). The tops were closely matched, but mode 4 of the back of #102 was 28Hz higher than #101 (6.7% difference). I was able to keep pair (3) long enough for extended playing sessions. This was not really necessary since the sound of these two mandolins was so completely different it was obvious to everyone which one was being played. I was not able to fool my partner when she could not see which mandolin I was playing, nor was I able to fool myself, nor the other instrument maker. #103 sounded to me to be by far the better sounding instrument, and everyone who heard the two mandolins agreed with me. #103 had a much cleaner tone and was more evenly balanced across the strings whereas #105 was louder and had a strong booming G string. Having evaluated these pairs of mandolins, it was thought that maybe my order book should be examined for more evidence. The examination was confined to mandolins with oval sound hole, top European Spruce, back Tasmanian Myrtle and my so called Goldfinch model (oval sound hole King Billy Pine top, Blackwood back) since these are in the greatest numbers. There are a few other oval hole mandolins made from different timbers, but the numbers are too small (1 or 2) to make any meaningful conclusions. The timbers do have a significant effect of the sound of the instruments (Coombe 1996 and 1999), maybe a bigger effect than tuning the free plates. F soundhole mandolins were not examined because of small numbers made from the same timbers, and also because the situation appears to be more complicated because it is seldom possible to match the top and back tunings. Mandolins made earlier than #75 were not examined because this was the first mandolin made from European Spruce sourced from Switzerland. All the Spruce topped mandolins have been made with this Spruce. A table of the free plate modes and the comments about the tone of the resulting mandolins is shown in Table 2. The comments have been taken direct from my order book with just a few minor re-wordings. Note that #75 was used as a reference for mandolins from #75-#86, and #87 was used as the reference after that. There was a change in the bridge configuration (see Coombe 2003), and the neck wood was changed to Queensland Maple on and after #87 (not on the Goldfinch mandolins which all have Blackwood necks). #80 and #89 have been excluded because of differing bridge configurations, and the bridge does affect the sound significantly. The percentage values are the difference between the top and back modes expressed as a percentage of the lower value. Most of the mandolins were excellent instruments, but one of each wood combination were somewhat disappointing (#104 and #105, highlighted in bold in table 2). Note that the tunings are not random. Each instrument was deliberately tuned so the top and back mode 4 was as close as physically possible because experience told me that this produced the best sounding instruments. What is consistently different about #104 and #105? Both do not have mode 4 matched between the top and the back. 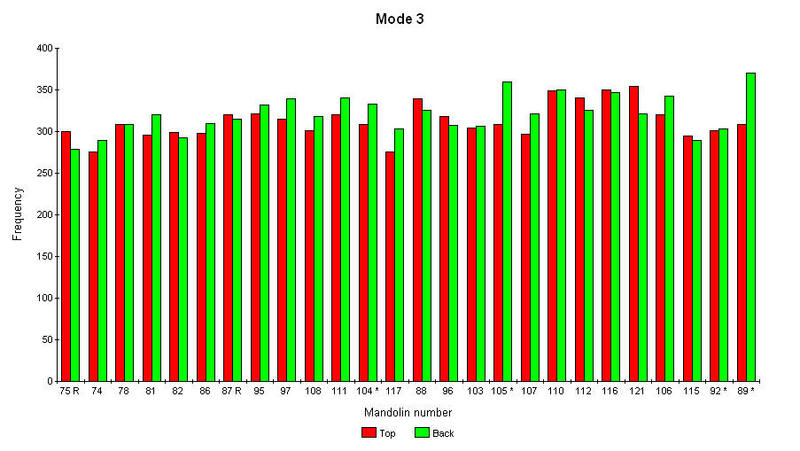 The difference between the top and back modes are 12% and 14.1% which is much higher than any of the other mandolins. The next closest is 4.7% in mandolin #78 which was a very successful instrument. #104 and #105 were different because of the physical properties of the wood did not enable me to tune the top and back mode 4 as close as I would have liked. This is something I am not likely to repeat because I would like my instruments to sound consistently excellent. Both mandolins also do not have mode 3 matched either, although the difference for mode 3 for #104 is not unusual so it is probably not significant. Other tests have shown that mode 3 becomes smaller or disappears, and mode 4 becomes by far the strongest mode after the ribs are glued (Coombe, in preparation) so mode 3 is most likely not as significant as mode 4. From this data, the probability of the two poorer sounding mandolins matching up with the larger differences in mode 4 purely by chance is less than 1% so is statistically significant. Beautiful warm sounding instrument. Rich sweet tone. Very nice indeed. Beautiful rich, smooth tone. Probably best so far. Treble has great clarity, sweetness and smoothness. Beautiful sweet sounding mandolin. Very responsive. Very nice sounding E string. Mary Shannon�s mandolin, it suits her well. Similar to #81, but not quite as sweet sounding. Has been mistaken for a Loar in a blind listening test recording (Ha!). Very sweet. Very good treble,. Similar to #75 but with a bit of boom on the G string. Nice. Superb mandolin. Best oval hole to date. Even balance, very sweet and clear treble. Unusually rich tone, very loud. Very nice, one of the best. Nice well balanced tone. Very clear treble, sweet and excellent clarity. Bass a bit thin. Lacking character. Big sustain. Somewhat disappointing. Remarkably similar to #87, just a bit more responsive and louder. Nicely evenly balanced, almost identical to #87. A bit more ring and sustain compared to #87. One of my favourites, I like it a lot. Very lively, clear and sweet. Loud and sharp. Good projection. Outstanding. Unusually rich, clear tone with plenty of volume. G string with a slight boom, D,A,E strings superb. Very nice sounding mandolin. Good even rich tone. Excellent clarity and clean sound. Not one of the loudest Goldfinch models. A bit disappointing. A bit too much metallic ring, G string quite boomy. Not as nice sounding as #103. Not as clean sounding as most of the Goldfinch models. One of the better Goldfinch models. Very even rich tone, also with good volume, but not the loudest Goldfinch. Very nice mandolin. Sweet, well balanced, loud. One of the best Goldfinch models. Loud, probably the loudest Goldfinch so far. Nice clear tone , evenly balanced. Exceptionally nice sounding D.A and E strings. Slight boom on G string. Very strong, powerful sounding mandolin. Big sustain and ring. Will be an amazing sounding mandolin in a few years time. Very evenly balanced, clean and sweet sound. Nicely responsive with good ring and sustain. Good volume. Nice one, I like it. Most of the mandolins I make are made from Australian native timbers, not the traditional timbers of Spruce and Myrtle. The question now arises as to whether this method of tuning is useful for traditional timbers. Table 3 shows the results from three Maple backed mandolins, two of which were tuned to match Mode 4 in the top and back. These two instruments I regard as some of the best sounding Spruce topped mandolins I have made, particularly #106. #106 was made from European Spruce and European Maple, and #115 was made from Engelmann Spruce and Birdseye Maple (i.e. Rock Maple). Also included is #92 which is made from Engelmann Spruce and quilted Big Leaf Maple. I was so disappointed in the sound of this mandolin that I have not used Big Leaf Maple again, although now I suspect the problem was the low tuning of the back relative to the top. Bright, very responsive and resonant. Excellent clarity and clean sound. Different from Myrtle. I think it will be a superb instrument once broken in. Sounded roughly equivalent to #87 at first, but after a month or so sounded much better. Really nice mandolin, good volume, excellent clarity, well balanced, lovely sweet and clear treble, warm sounding bass. Excellent instrument. I did not like it quite as much as #112 Goldfinch. Sweet and delicate sounding. Not as much bite as #87. Light and responsive. Relatively quiet. Not up to my usual standard and definitely not as nice as #87. One particular mandolin that was excluded from the above tables because of a non standard bridge configuration is particularly interesting. This mandolin was disappointing at first, with an overly mellow weak sound and with a bass that was overpowering. However, the problem was solved by replacing the ebony bridge saddle with a Blackwood saddle. Blackwood saddles give a much brighter and sweet sound (Coombe 2003). Examining the plate tunings, one notes that this mandolin did not have mode 4 in the top and back closely matching. Overly strong bass with Ebony saddle. With Blackwood saddle well balanced, sweet and clear. Figure 2 shows the data presented in tables 2 and 4 pooled into graphical form. Note that on the X axis R indicates the reference mandolins, and * indicates the relative poorer sounding mandolins. It is clear from these graphs that there is no correlation with mode 1 or mode 3 and sound, but the correlation between the differences with Mode 4 and sound is clear. It does not matter if mode 4 of the top is tuned higher or lower than the back, what matters is the difference . This supports the contention of many mandolin makers that it does not matter what absolute frequency the plates are tuned to. What does matter is the relative relationship of mode 4 between the top and the back. This is a little different from violins where the recommendation is to match mode 2 (equivalent to mandolin mode 1) in the top and back, and to keep mode 5 (equivalent to mandolin mode 4) within a tone (Hutchins 1983). 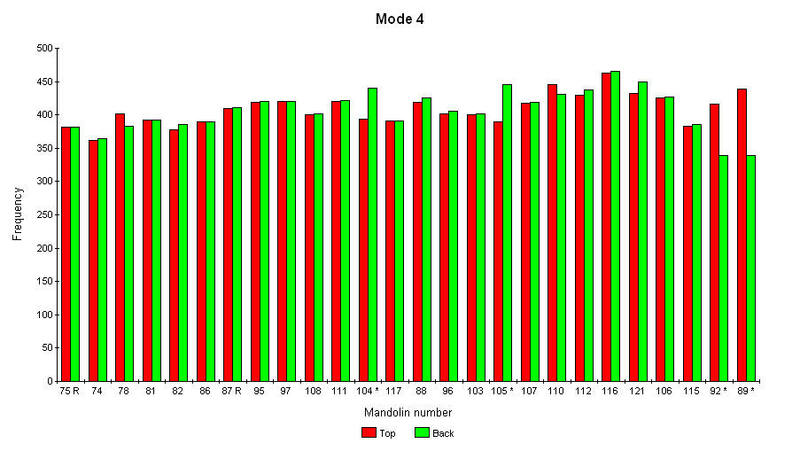 In mandolins, it does not appear to matter how mode 1 is tuned. Examining table 1, it can be seen that the free plate tuning of pair (1) is near identical. Tuning of pair (2) were identical for the Red Spruce tops, but slightly different for the backs. Free plate tuning of pair (3) was completely different. This is in close agreement with the tonal qualities of the mandolins, with pair (1) sounding identical, pair (2) sounding very close to identical, and pair (3) sounding completely different. 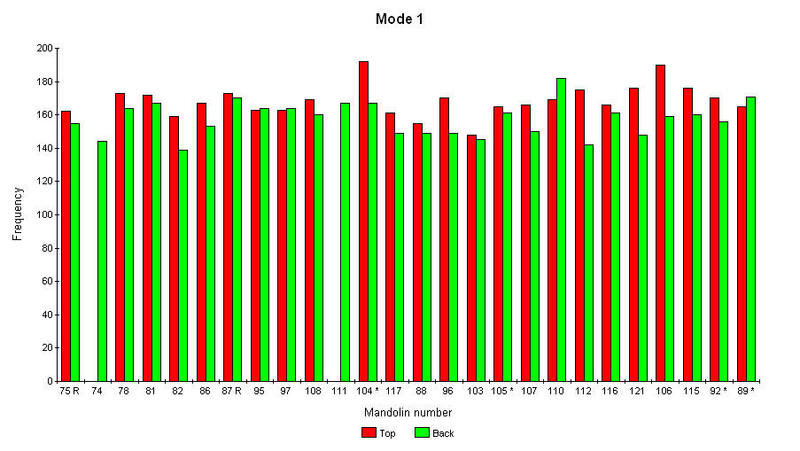 The results presented in Table 2, and also the evidence from the mandolin pairs does support the hypothesis that the relative tuning of the top and back free plates, particularly that of mode 4, does influence the tone of the completed instrument. Overall, taking into account table 4 and the 3 Maple mandolins, the evidence is convincing. Note that these are all oval soundhole mandolins, so this conclusion does not necessarily apply to F soundhole mandolins, but it does appear to be relevant for mandolins made from the traditional Spruce and Maple combination, although due to low numbers and differing woods is not as convincing. It appears that so long as the frequency of mode 4 of the top is within 4 -5% of the back then the resultant finished instrument is a fine sounding mandolin. My experience with mandolas also gives some indication that it may be relevant to mandolas as well since the one any only mandola I have made that had mode 4 of the top and back plates closely matched is easily the finest sounding mandola I have made to date. It is interesting to note that one commonly repeated comment about the "well tuned" mandolins is that the sound was "well balanced", i.e. even tone across the strings and up the neck without any obvious changes in volume or tonal qualities. The disappointing instruments were all unbalanced. Thus at least the technique does greatly increase the probably of a well balanced even sounding instrument even if it does nothing else. Mandolin #89 is particularly interesting because it illustrates the limitations of the technique. It was certainly consistent in that the plates were not matched for mode 4 and the resulting sound was disappointing. The fact that I was able correct the deficiencies in the sound by changing the wood in the saddle indicates that the results presented here really can only be considered relevant to the mandolins I make, in the standard configurations I use. If I had used Blackwood saddles in all my mandolins, then the conclusions of the paper probably would have been quite different. The optimum free plate tuning probably would have been similar to mandolin #89, and all the other mandolins would have been disappointing because they sounded too trebly and bright. Extending this to mandolins made by other makers where the bridge configuration will be different and other configurations will also be different, if these makers tune the free plates the same as I do, then they may be quite disappointed with the results because the tunings are not optimal for the way they make their instruments. This could explain why free plate tuning is so controversial. A particular tuning may work for one Luthier, but not another Luthier because the instruments are not made the same, and will have quite a different sound. Thus I would caution readers of this paper that they may not get the same results as I have with the mandolins they construct themselves. Blindly copying the tunings and expecting wonderful results would be unwise, because that probably won't happen. The small piece of evidence presented in this paper represents a huge amount of effort on my part. Unfortunately there is precious little evidence from other makers. The only evidence I have seen has been one other report on an Internet forum of a pair of mandolins made by another maker that were tuned identically and ended up sounding identical as a finished instrument (unpublished). The evidence available to date certainly does not disprove the hypothesis, which is an important point to make. As for predicting the tone of a completed instrument, I think the best we can hope for is if you can repeat the free plate tuning in two mandolins of identical construction, the resulting tone is very likely to be identical or at least very similar � i.e. consistent, which is what I was arguing in my previous paper (Coombe 2005). In addition, if the free plates are tuned such that mode 4 in the top and back are very close in frequency, then the completed instrument is likely to have a pleasing and well balanced tone. This is a significant conclusion from the data presented in this paper. It is something that can be applied in practice by any Luthier who makes a mandolin. However, the sound of a completed mandolin is dependent on a host of other factors, not just plate tuning, so these need to be constant if the instruments are to sound identical or close to identical. Note that a pleasing tone has been achieved in my mandolins, other makers may change some other factor that alters the tone so it is no longer pleasing when mode 4 is matched. Matching mode 4 does not necessarily guarantee a "well balanced" and pleasing tone, but if a mandolin is constructed similarly, there is a high probability the completed instrument will sound good. The results presented here certainly merit further investigation by other makers.